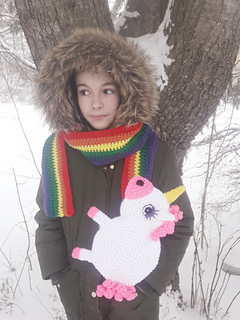 The Reversible Unicorn Rainbow Barf Scarf / Let a Rainbow Rip Wrap is a unique, novelty winter accessory! 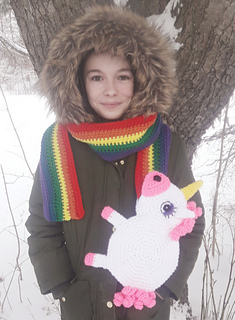 This pattern creates a fun scarf for kids and adults. It’s meant to be funny. 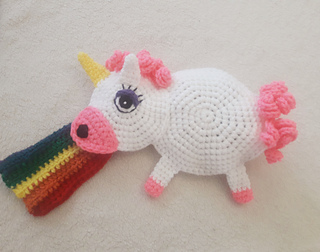 We all know unicorn’s are magical creatures, and only toot and toss rainbows!!! 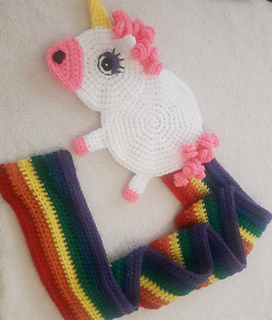 The scarf is reversible and can be worn with the rainbow coming out of the unicorn’s mouth or its behind. 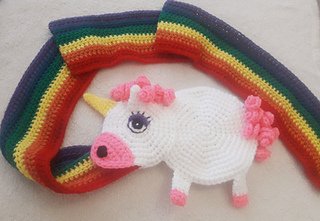 The scarf can also be stored inside to make a cute little unicorn pillow / scarf storage. You can get creative with your colors, for never-ending choices. This pattern uses US Standard terms and basic crochet techniques, with some sewing involved. It is an advanced beginner level pattern. It is printer friendly for the pieces, with lots of pictures included for the assembly. SC, HDC, Increasing, Decreasing, SL ST, CH, BL, FL. This pattern has been tested. Visit A Moore Eh Crochet on Facebook to share your projects, see what is in the works, and for testing opportunities! If you have any questions about any of my patterns, please feel free to contact me for assistance!